The days you spend studying in your dorm room, relaxing and shooting the breeze with your roommates should be spent wrapped in comfort with Kappa Delta Phi Blankets, Pillows and Home Goods from Greek Gear. You don't have to be an interior designer to make your dorm room a more comfortable and attractive place to spend your time. 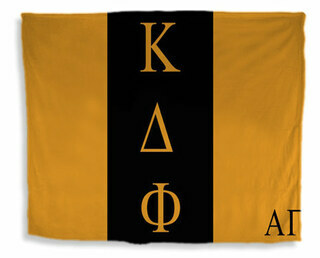 We have specialty home goods for KDP members, like the Satin Throw Pillow. It's uniquely designed with your fraternity color and symbols in mind. Use it to throw on your couch or sofa, or get a few to decorate your made-up bed. Welcome guests to your dorm room or chapter house with a custom Welcome Mat. A large image of the crest appears in the background, with your letters in the forefront. You determine what the welcome message will say to guests. 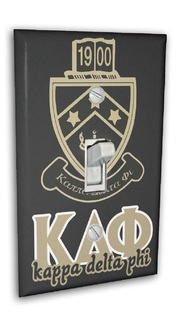 Step your d�cor up a bit by replacing all of your chapter house Light Switch Covers with the specialty cover we sell here at Greek Gear. It's a decorative way to say good morning, good day and good night with your fraternity on your mind. Get cozy and take your time shopping our selection of Kappa Delta Phi Blankets, Pillows and Home Goods. We can have them shipped directly to your dorm or to your home in time for moving day. Rush options are available for some items! Kappa Delta Phi Blankets, Pillows & Home GoodsThe Greatest Selection. Period.